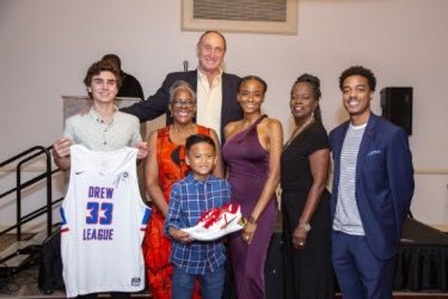 The Drew League Foundation, a charitable organization designed to help the youth of South Central Los Angeles and surrounding areas defy the stereotypes brought forth by the communities they call home through education, celebrated its 10th anniversary with a gala and scholarship awards event at the Proud Bird on Saturday (July 14). Over 250 attendees gathered to raise money for scholarship awards presented to current high school students in the underserved greater South L.A. community. On Saturday, seven students received $2,000 scholarships as they prepare to enter into freshman year at their respective colleges. 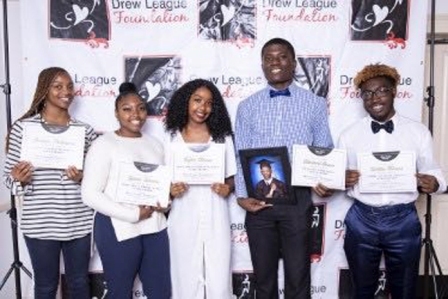 “This event is the culmination of our community paying tribute to our community leaders, while recognizing our emerging young talent as they commence to college's around the country," said Michael McCaa, Drew League Foundation CFO and Board Member. Past recipients have gone on to graduate from prestigious colleges and universities like Georgetown, Howard University, USC, UCLA, UC Irvine, Long Beach State University. One such notable Drew League Foundation alumni is professional basketball player and Drew League standout Casper Ware Jr., who graduated from Long Beach State. This year, there was a newly enacted scholarship award named after the late Christopher (26) and Jonathan Baxter (23) brothers, who lost their lives last November in a triple-fatal collision. The Baxter brothers, who played six seasons at the Drew League, were beloved by the summer pro-am community. 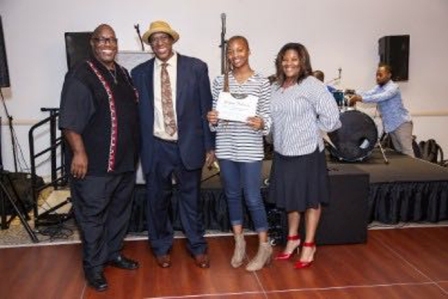 Their father, a 30-year LAPD veteran, Kenneth Baxter was invited as a guest of honor as well as members of the Baxter family. “It was pretty emotional,” said Smiley. The gala featured the addition of a silent auction where attendees were able to bid on exclusive items like a signed Stanley Johnson of the Detroit Pistons’ Drew League jersey, a Lakers suite for a game this upcoming season, a pair of lower level tickets to the Rams vs. Chargers game, a weekend getaway at the Ritz Carlton in Palm Springs, and all-access to a Drew League playoff game that will include parking, access to the locker room and a courtside seat at the game. The foundation raised $50,000 including a sizeable $25,000 donation by former NBA player Baron Davis, who directed the Drew League Documentary in 2015 and has been a longstanding player in the Drew League. The Drew League Foundation continues to meet the needs of the underserved community through developing at-risk youth and building their capacity to acquire life skills for today's workforce. For more information and to donate to the Drew League Foundation, visit http://drewleaguefoundation.org.